Eternal life grant unto her, O Lord, and let perpetual light shine upon her. Today, September 3, 2015, is the happy occasion of our priestly society's patronal feast of St. Pius X. So it was with sorrow this morning that the United States District Office learned of the passing of Mrs. Francoise Fellay, the mother of our Superior General, Bishop Bernard Fellay, from whom she received the Church's Last Rites only yesterday. Her funeral will take place on the morning of Saturday, September 5, at the Econe seminary's Immaculate Heart of Mary Chapel. 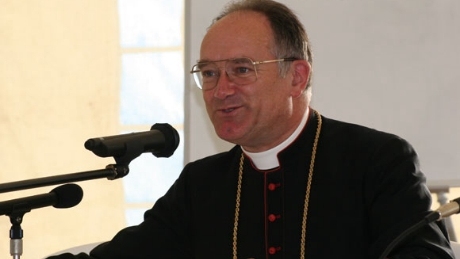 Bishop Fellay will offer the Requiem Mass for the repose of his mother's soul, and afterwards her remains will be buried in the nearby cemetery of Fully. We kindly ask our readers to pray for the repose of Mrs. Fellay's soul. Submit your intentions to our Mass Association!